The GH-C comes with complete GH-1 and GH-2 kits, plus a whole lot more. 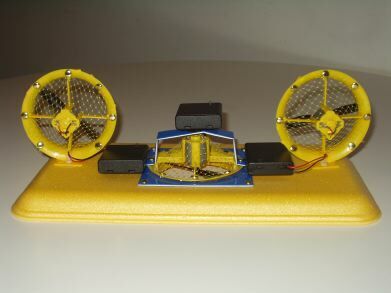 The GH-C kit comes with a total of 4 ducts (4 motors, 4 AAA battery holders, 4 propellers, and 4 plastic ducts, 4 duct stands), one GH-2 cabin, two GH-1 cabins, three airboxes, one WaveJumper attachment, skirt material, foam tape, foam trays of various sizes, and three special parts shown below and featured in the designs on this page: a thrust-blocker/elevator, a create-a-lift-duct part, and a die-cut pointed hull. Single duct crafts such as the GH-1 may be called "hovercrafts" but they don't really hover -- that is, they don't hang motionless in the air. 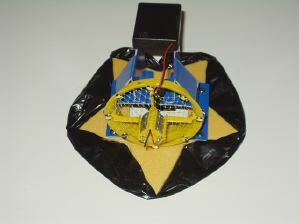 Whenever the plastic duct supplies lift, it also supplies thrust. When the craft rises up, it also darts forward. 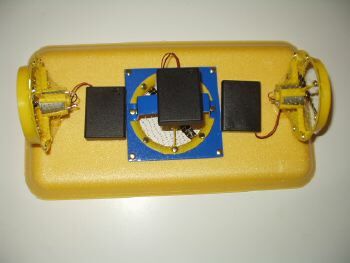 The thrust blocker simply "turns off" the thrust, and allows a single motor craft to hover. But that's not all! 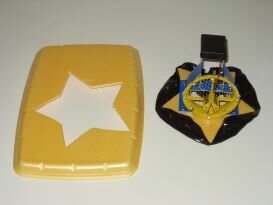 Turn the "thrust blocker" sideways, and it becomes an elevator. An elevator directs some of the thrust air up or down. If the rear of your craft isn't hovering high enough, you can send of the thrust air downward to raise it back up. If the front of your craft isn't getting up high enough, you can send some of the thrust upwards to bring the rear down which in turn brings the front back up. Sound complicated? It isn't really. Try it and see. Want to create a lift duct in a hurry? 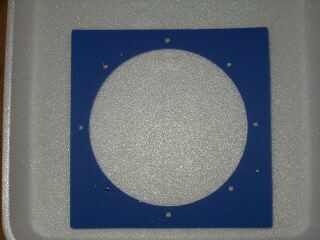 Use this part as a template to get exactly the right size holes, or use the part directly (as shown numerous times below). When used directly, you can be really lazy. Knock out a rough hole (maybe with your thumb if you are working with foam) and then cover up the rough edges with this part. Ok, on to the designs! A Pointed Hull -- the "GH-P1". Every GH-C construction kit comes with a pointed hull designed to fit the parts from the GH-1. 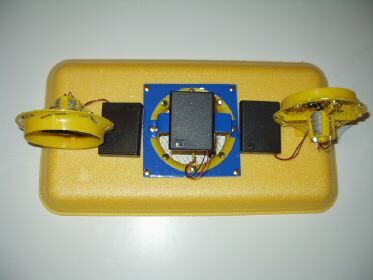 The hull is a flat shape, made from the same foam/plastic composite material as the parts from the GH-1 and GH-2. 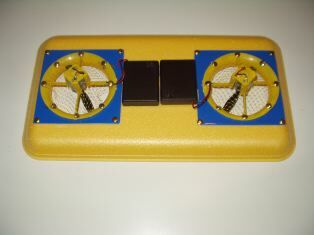 The skirt for this craft uses the same skirting material as the GH-1 & GH-2, as do all skirts on this site. Surprisingly, even though the hull is not shaped like a foam tray, the craft can travel across on smooth floors without any skirt at all. 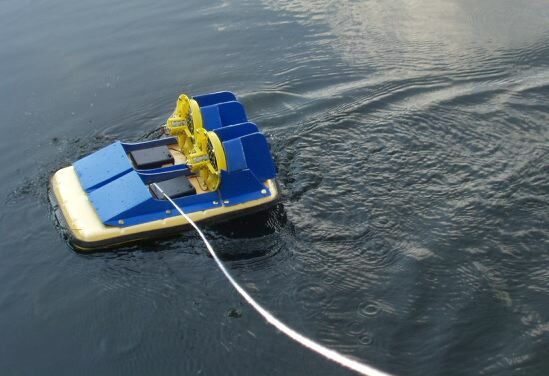 A first time observer would be sure that the craft is, in fact, a sled rather than a hovercraft. This can be proven to be false by closing the airbox trapdoor (see the section on how the airbox works if this is unclear). 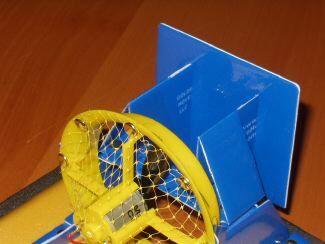 When the trapdoor is closed, the "sled" receives twice as much thrust as before, and yet it barely moves. Open the trapdoor to give the craft some lift and it will putter away. Of course, the craft performs much better with a skirt. So, is the shape just for appearances? One advantage of a pointed craft becomes clear when you try to use the craft indoors in amongst furniture. A rectangular craft can become trapped by a variety of chair and table legs. The GH-P1's pointed nose and curved sides allow the craft to escape from a maze of chair and table legs that tend to trap a rectangular craft. 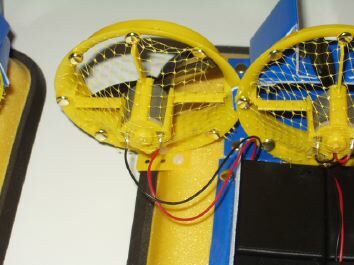 If you are planning to use radio control with your craft, you'll discover another advantage: a rectangular craft can be trapped against the sides of a wall. Think about it: if a rectangular craft is along side a wall, turning the rudders one way forces the nose toward the wall, and turning them the other way forces the tail toward the wall. But sometimes neither of these actions will do any good -- both actions require the craft to roll along the wall and since the sides of a rectangular craft are straight, the craft may not roll at all. The curved sides of the GH-P1 allow the craft to easily roll out of this problem. So, if the pointed shape has advantages, what about other shapes? 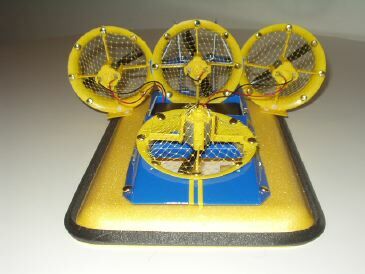 Goldstein Hovercraft's exclusive skirt system works with any shape. 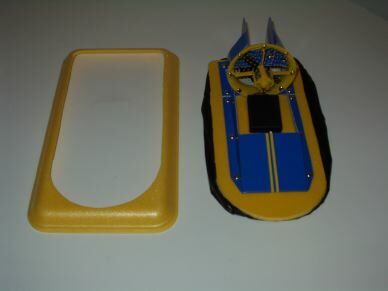 You can cut out any shape you want from a suitably large foam tray and then attach the skirting material and an airbox and/or a lift duct to quickly turn a flat piece of foam into a hovercraft. 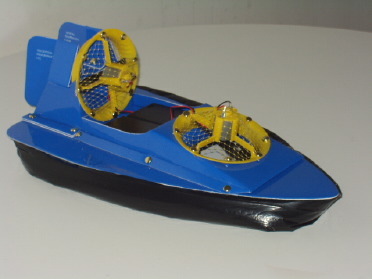 The example below shows a craft shaped like the one favored by many commerical sport hovercraft manufacturers. 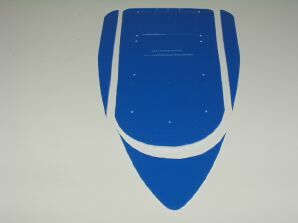 Any source of lightweight flat material will serve as a hull. 1/4 inch thick foam from home improvement stores is perfect. You can even use the pointed hull that comes with the GH-C if you aren't crazy about the shape. 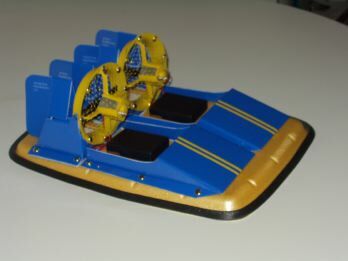 The pointed hull is shown below cut up to form a sporting hovercraft shape. Any shape is possible. 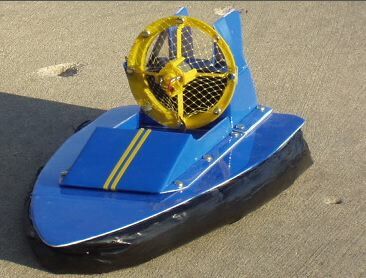 For example, one customer heard about a full size hovercraft called a "starcruiser" and decide to build a model of one. And it worked quite well! 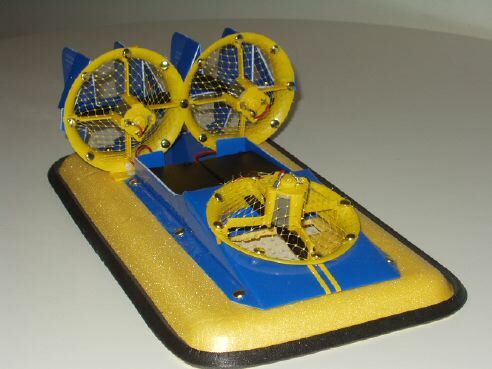 (This is a bit of a joke for hovercraft enthusiasts -- the real Starcruiser hovercraft doesn't look anything like a star....) In all seriousness, a star shaped craft might not be an advertisement for good hovercraft design principles, but this example does demonstrate how the GH-C kit lets kids (and kids-at-heart) exercise their creativity! 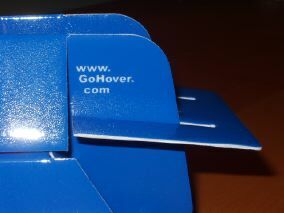 Attaching a skirt isn't hard, but young children may find it to be the least straightforward part of the hovercraft building process. In that case, there are several ways to create a "tray shaped" craft that doesn't need a skirt, and yet can be whatever shape you want. 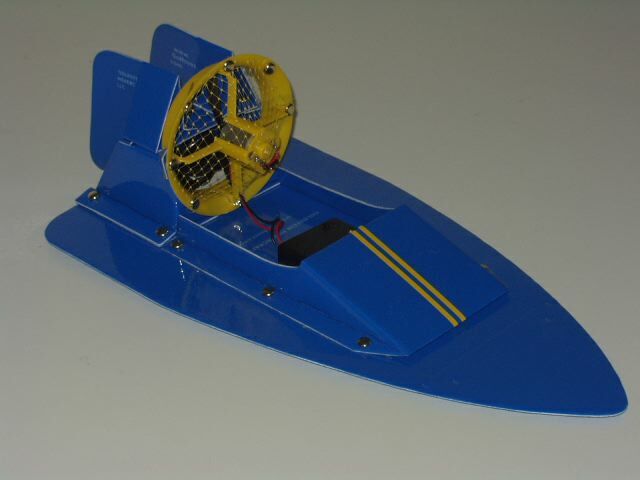 Detailed instructions are provided with the GH-C.
A Pointed Two Duct Craft -- the "GH-P2". All the information needed to adapt the pointed hull for twin duct operation is provided. Guides showing where to attach the GH-2 cabin and where to cut opening for the the lift duct are pressed onto the pointed hull itself. 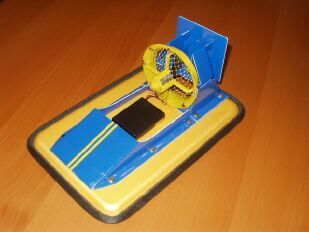 This craft is fun because it give you an opportunity to fine tune the airbox trapdoors. Instead of putting them all the way up or down, you can try to find the right intermediate trapdoor setting for the surface the craft is traveling on. 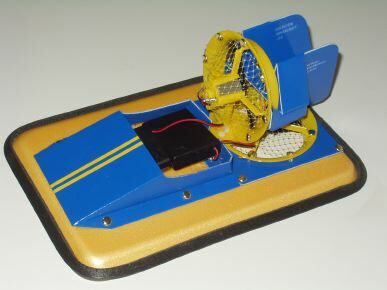 This craft has interesting performance in its own right, but before we get to that, notice that three kinds of parts not used in the standard GH-1 and GH-2 are used here: the rotating duct-stand, the create-a-lift-duct part, and the battery perch are each put to use in this design. 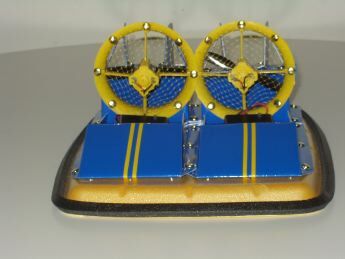 If you thought the picnic plate flying saucer could spin fast, just imagine how faster this craft spun when one thruster was pointed forward and one was pointed backward. (I'll have to make a movie of this and post it here). Consider that all three motors were contributing to the spin! And yet, turn each thrust duct ninety degrees and the craft isn't going anywhere. This way, it went fast! Gives us a hint about the next craft. Fast in this direction too. Surprising, given the central obstruction. Is there such thing as too much power? Possibly. This is a GH-2 with two more side thrusters. This craft looks impressive, but in practice, it was dragging its tail a bit. Opening the airbox in the back increased the lift, but of course, this cut into the thrust and defeated the all important goal of "maximum speed"! The two side ducts were used as "easy on/easy off" thrusters. 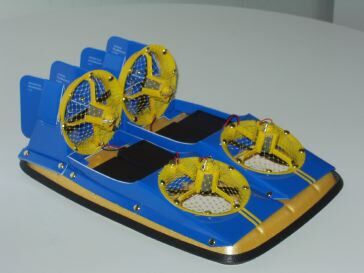 So it is back to the drawing board for this triple thrust four motor hovercraft. Perhaps the solution is as simple as moving the battery packs further forward. Or perhaps the two side ducts could be moved forward. A larger tray would help too. That twin thrust duct craft shown in the last section was awfully fast. Is there a four motor version that is faster? Buy the GH-C and see if you can design one. 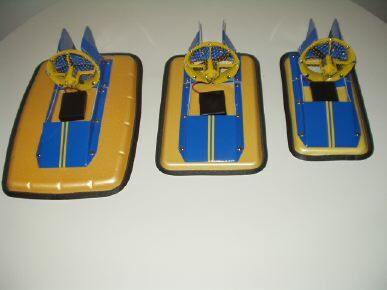 Which of these crafts is the fastest? Which hovers the highest? Which one can best get across bumpy pavement or a slightly shaggy carpet? You can ask these questions and many others about all the designs presented on this website, and maybe more interestingly, you can ask them about the as-yet undreamed-of designs that can be built using the same components. What works best on water? Does the shape of the hull matter? Does the size of the hull matter? Does the amount of power matter? When you get bigger, you add weight, but you also spread that weight over a larger area. When you add power, you also add weight. If you add power, and then add size to compensate for the extra weight, have you compensated for the extra weight of adding size? 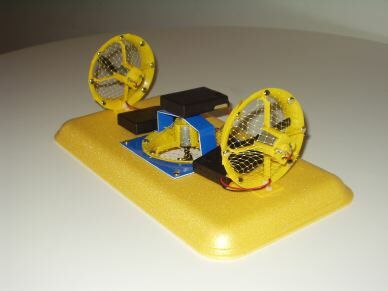 Find out by experimenting -- the kits' standardized components allow you to control your variables. Use a mathmatical theory if you prefer, and then check your calculations against the real world. Have fun! 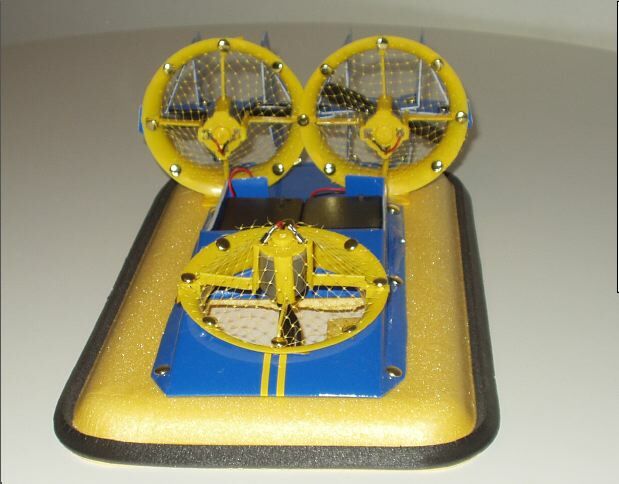 The GH-C "Design Your Own Hovercraft" kit requires at least 4 and preferably 8, 12, or 16 AAA size NiMh rechargeable batteries. 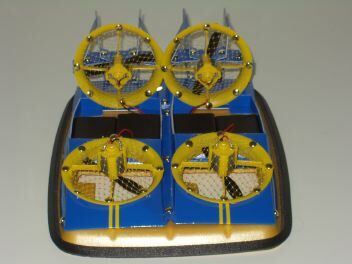 Each motor is optimally run with 4 batteries. 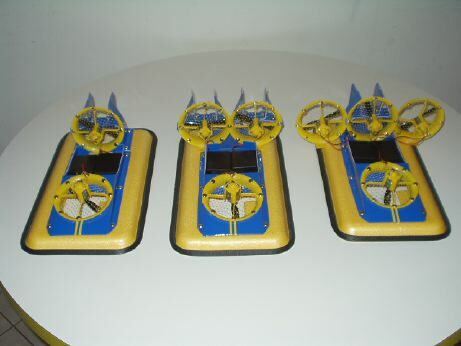 If, for example, you want to be able to operate 3 motors at once, you'll need 12 batteries.